Kinklinks are a variety of Chain Chomps that are used to hold up chandeliers in Bowser's Keep. 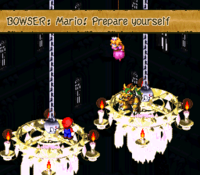 During the events of Super Mario RPG: Legend of the Seven Stars, Mario and Bowser fight on a pair of chandeliers, each one held up by a Kinklink. Bowser proves too difficult to defeat, so Mario (with some timely advice from Princess Toadstool) attacks the Kinklink holding up Bowser's chandelier instead. As a result, the Kinklink drops the chandelier along with the Koopa King. However, as Bowser fell, he starts to throw Hammers at Mario's Kinklink. Eventually, the second Kinklink drops Mario, sending him plummeting to the ground below, though Mario manages to get back up by jumping on Bowser. During the battle with Boomer, the Kinklinks are replaced with Chandeli-hos. The Chomp Shell, a weapon usable by Bowser, is the shell of a Kinklink. According to Orb User's Psychopath thought, they hate Kinklinks. This page was last edited on April 9, 2019, at 16:09.